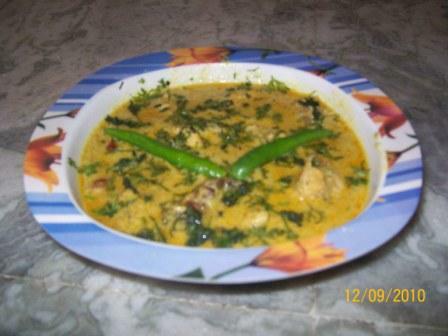 This chicken curry is not the usual one that generally everyone prepares, but its a little bit different. It has coconut in it, which adds the real taste in it. Its a microwave oven recipe. Dry roast the coconut and grind it into a fine paste along with kaju and green chillies. Take oil in a microwave safe bowl and add the red chillies, breaking those in half, and heat it covered at MicroHi (MHi) for 1 min. Add the ginger-garlic paste, chicken pieces and mix well. Cover the bowl and cook at MHi for 10 mins with stirring once in between. Now add coconut paste, chili powder, turmeric powder and salt. Add the hot water and covered at 80% power for 10 mins. If you need more curry, add water. At the end add the tamarind pulp and coconut milk. Cook covered at 70% power for 5 mins. Garnish with chopped coriander leaves and serve. Interesting recipe, I’ll try this soon!